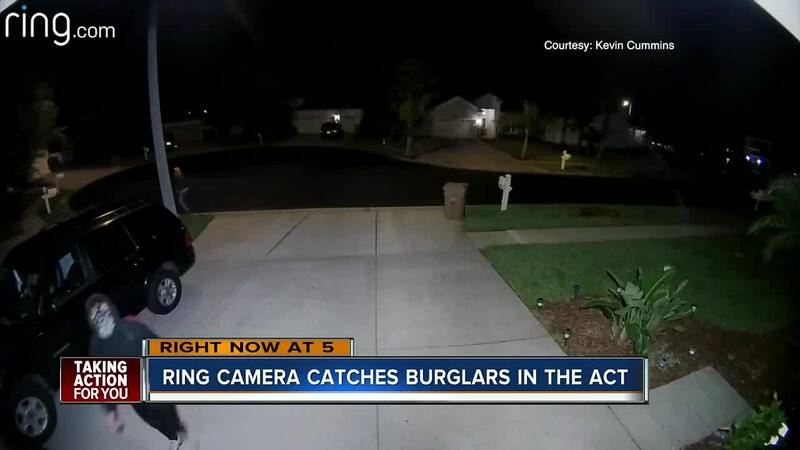 WESLEY CHAPEL, Fla — Neighbors in Alchester Place, a subdivision in Wesley Chapel, are on alert after a floodlight Ring camera caught two masked people walking up to houses and casing the neighborhood. They say it happened Tuesday morning around 1:30 AM. "This is them coming up, you can actually pinch and zoom,” said Kevin Cummins, as he looks at the video on his iPad. An alert pinged on his phone that woke him up. 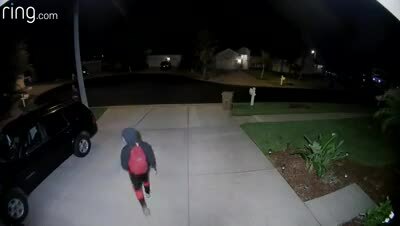 When he looked at the video, he saw the two people with handkerchiefs over their face scoping out their garage. "You immediately thought they may be trying to gain entry into the house so I was prepared for that,” he said. Cummins called the Pasco County Sheriff’s Office right away. Minutes later, deputies showed up with K9’s and flashlights scoping out the neighborhood for the two people. "They were here and just minutes it was that fast,” he said, of the deputies. He says the Sheriff’s office put a helicopter in the air and flew over the neighborhood and surrounding areas. They didn't find the pair, but did find a few cars broken into. They also took a copy of Cummins video. "They felt that was extremely good video,” he said. His camera has built-in floodlights that go off with motion but you can turn them on whenever you want. Plus you can turn on an alarm that will hopefully scare any potential thieves away. The floodlight ring will cost you $250 bucks. You can get a ring with a spotlight for $200, and there are some other brands out there for cheaper like the Nest, or a Maximus standard door camera for just under $70. Cummins says the camera brings peace of mind. "You’re going to at least have some deterrent plus footage - at the end of the day they’re gonna get caught,” he said.